I just got my 2013 ML350 home and noticed the front brake rotors look terrible. It drives and brakes fine but I am concerned I will need a brake job soon. I was looking at everything else and did not think to look at the rotors. Curious on what people think for condition of the rotors for a CPO. It may meet the min. thickness for a CPO but condition wise they are terrible and you can feel the grooves. This is not normal for ML's right? The previous owner must have driven it hard. Appreciate any opinions. I am going to complain to the dealer but not sure how well that will go. They are fairly rough.....how many miles/kilometres ? If there is no vibration, grooving does not effect braking, just looks crap. They dont look like the OEM rotors, mine are ventilated but your's dont look like they are. They are not all ventilated, it depends on model/package. I have seen rotors in such bad shape after having done some offroading. Sandy mud gets stuck on the brakes and can end up damaging the rotors as such (the pads are obviously damaged in a similar pattern). If you take the pads down, you might still be able to see some sand grains embedded in the pads. Yeah, it brakes fine now, I am more concerned for how long. I know a CPO is not new condition but this to me seems like they should have been replaced. I would have at least pushed for this when I signed the paperwork if I had noticed. It has 25K miles on it and is in otherwise great shape. The deal this month for CPO is 2 years free maintenance and the first 2 months paid by MB. 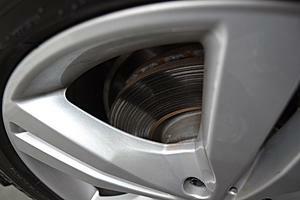 Maintenance does not cover pads and rotors. Ask for the CPO inspection sheet for your vehicle, it will list pad/rotor thickness. just mention it to the salesperson, tell him you want the pads replaced and the rotors turned, should not be that big of a deal. Thanks. I know wear items are not included and this is my plan. I just sent an email and will see what they have to say. 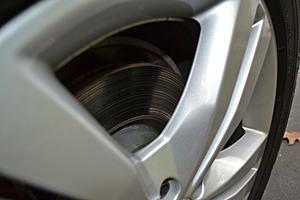 FYI - Mercedes does not "turn" rotors - and yes, original CPO inspection report should show thickness remaining by visual inspection both pads and rotors. I have a 2013 ML 350 AWD 38,000. miles. CPO also. Mine are same way. Questioned it with service tech and they measure them and my were within limits on the front but rear ones look twice as large on the pads. They replaced rear pads before I got the ML.Rotors are about half as bad as yours. Through this was king of cheap of them doing this. My first Benz also they did not show anything on contract of what work was done on the CPO? I had to ask service tech to show me some of what was completed. They do like 150 inspections on CPO but they should be held accountable on what they have done. Could say anything? Hope this helps! A few years ago I bought a CPO CLK. When we pulled off the front wheels to check pads found that the pads were Lucas-NOT MB. Called MB New Jersey re this & some other problems. Local dealer knocked himself out to make everything perfect. Guess N.J. put the heat on him on him to bring everything up to CPO standards. Most normal people think that if you bought a used CPO car, that all parts incuding the rotors are within spec so that it can be sold as a CPO. If they are not warped and are even half a millimeter above minimum spec, then they are perfectly within their right to sell it with them on. You bought a used car, they are a wear-and-tear item and they are within spec. What exactly is it that you're looking for? flowrider99 & 350MH83 - the rotors are most certainly vented. You can easily see the vanes (where the slight surface rusting is) in the first pic. OP - as for the grooving on the surface, it is perfectly normal and there is ZERO need for concern. I don't get the "condition-wise they're terrible" statment - that's exactly what used rotors look like. The only time to be cautious is when you change the pads without changing the rotors (machining the rotors is IMHO a huge waste of money), at which time you need to make sure that you bed the new pads in properly and give yourself more stopping distance during the first few days (depending on your driving style and how much you drive) as the new pads are only going to be gripping the tops of those ridges until the pad surface gets properly seated on the rotor. You'll easily feel the extra pedal effort required when braking to achieve the same stopping force until they get fully bedded in.